According to Director of Engineering J.R. Rogers, the San Diego Entercom station cluster is all nestled into their new facilities across the street from iHeartMedia at 9665 Granite Ridge Drive. 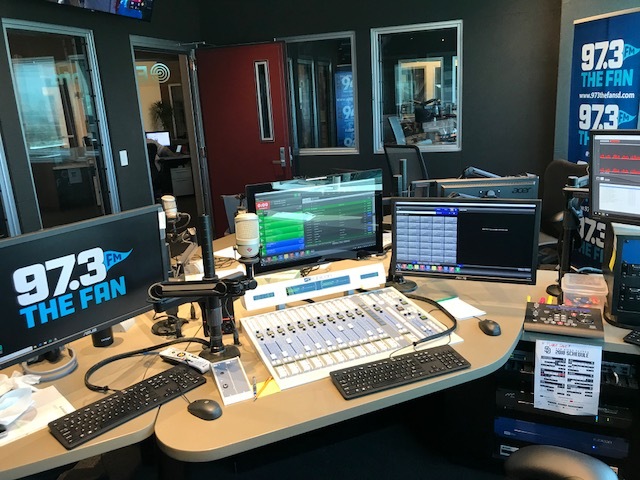 New studio at Entercom for KWFN The Fan 97.3, San Diego. Photo by Steve Cilurzo. Unlike their cramped studios at CBS on Linda Vista Road and Entercom (formerly Lincoln Financial) on Murray Canyon Road, the new location has 14 studios, including a performance hall, video production and edit suite, five live FM studios, five production-edit studios, and two voicetrack studios. 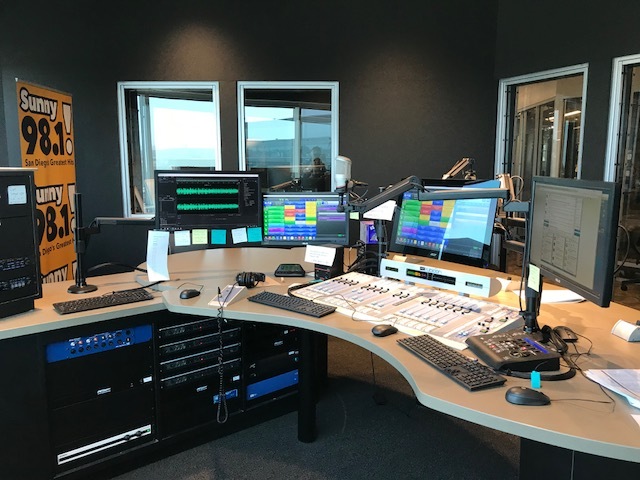 The Entercom suite, with Sunny FM (KXSN 98.1), Alt 949 (KBZT 94.9), and KSON Country (now at 103.7), moved first at the end of 2017. The old CBS cluster, The Fan (KWFN 97.3) and KYXY 96.5 joined this year. New studio at Entercom for KXSN Sunny 98.1 , San Diego. Photo by Steve Cilurzo. That “new technology” included SAS and their Dante AoIP as well as WideOrbit automation that neither station group had used before. Integrator on the project was PME of Chicago. In addition to J.R., the local technical crew includes Bill Eisenhamer, Chief Engineer for KBZT, KXSN, and KSON; Mike Prasser, Chief Engineer for KYXY and KWFN; and Steve Cilurzo, Assistant Chief Engineer to Mike and Bill.